When we observe animals pollinating nearly 90 percent of the plant species found on earth, we are witnessing a process more than 250 million years in the making. Sexual reproduction among plants, from a botanical standpoint, is nothing more than the transfer of pollen grains from a flower’s male anthers to a flower’s female stigmas, enabling fertilization. Once transferred, pollen grains germinate, grow pollen tubes into the plant’s ovaries, and deliver gametes to produce seed and endosperm. 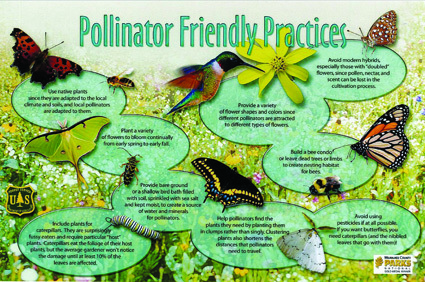 Most readers of this journal are well aware of the importance of pollinators to human life. Scientists estimate that between 75% and 95% of all flowering plants – more than 1200 crops and 180,000 species – need at least some help from these creatures. Another way to put it is that every third bite of food you take only exists because of pollinators. Their contribution to the global economy is worth some $217 billion dollars in agricultural productivity alone, not counting their services in cleaning the air, stabilizing soils, protecting us from more severe weather and supporting other wildlife. 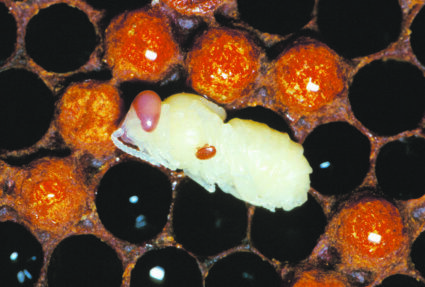 Varroa mite (the small tick-like insect in the center of the picture) is seen on a developing honey bee pupa (the large white mass which has been removed from the cell for better visibility). The dark blob to the upper left of the pupa is the bee’s developing eye. Varroa mites feed on adult workers and transmit viruses among bees this way, but they can only reproduce in the brood – in the prepupal and pupal stages of bee development. As I am an entomologist studying bees, people stop me all the time and ask, “How are the bees doing?” As is often the case for questions asked of a research scientist, this is a simple question with a complicated answer. Let’s take these answers one at a time, with honeybees first, because those are the first bees that come to mind for most people. 1. Animal pollination plays a vital role as a regulating ecosystem service in nature. Globally, nearly 90 per cent of wild flowering plant species depend, at least in part, on the transfer of pollen by animals. These plants are critical for the continued functioning of ecosystems as they provide food, form habitats and provide other resources for a wide range of other species. 2. More than three quarters of the leading types of global food crops rely to some extent on animal pollination for yield and/or quality. Pollinator dependent crops contribute to 35 per cent of global crop production volume. 3. Given that pollinator-dependent crops rely on animal pollination to varying degrees, it is estimated that 5-8 per cent of current global crop production, with an annual market value of $235 billion – $577 billion worldwide, is directly attributable to animal pollination. The sun sets over the ridges of Mexico’s Sierra Madre mountains. After fifteen years of slow, dry growth, the spiky blue Agave tequilana will form its first and only flower, a towering twenty-foot column topped with yellow. Fifteen years of production are wagered on this one flowering event. 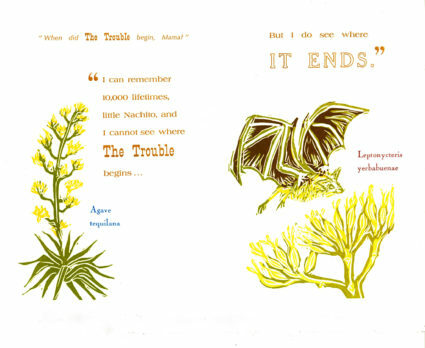 If the bat is late, the plant will die; if the flower is late, the bat will die. The bat comes. Under the stars she pushes her furry, pollen covered face and long pink tongue into the fragrant, nectar dripping stamens. 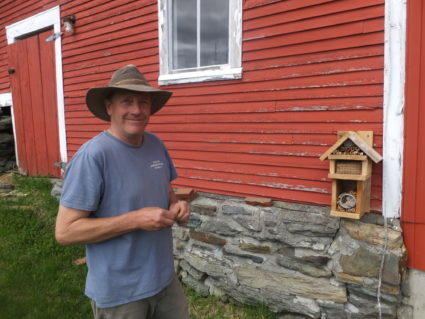 Native bee conservation is near and dear to our hearts. During the past 25 years, our farm in northern Vermont, The Farm Between, has evolved from a diversified farm operation with organic meats, eggs, and fruits and vegetables to an organic fruit farm, and fruit and pollinator plant nursery. Enhancing biodiversity with pollinator and beneficial insect habitat has been a key focus over the years to increase the viability of our farming business while also healing and regenerating the ecosystems that we steward. 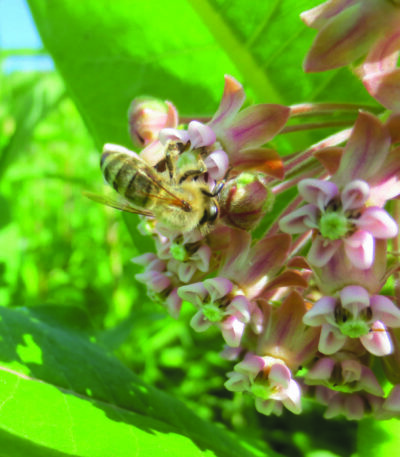 In this article, we will outline the things that farmers, homesteaders and other landowners can do to enhance native pollinator populations on their land to increase pollination services and their own farm viability. It’s Spring in the Northeast, which means expansive season is upon us. Just as the trees put out flowers, opening their most delicate parts to cross pollination, so too do hives flex their reproductive organs. As we hurtle towards the crescendo of daytime hours that is Summer Solstice, the honeybees are abuzz with all of the resources and conditions necessary for optimal reproduction. Our role is to step in and facilitate reproduction so we, as beekeepers, can reap the rewards within our apiary rather than loose our bees to swarms, the natural reproductive response. 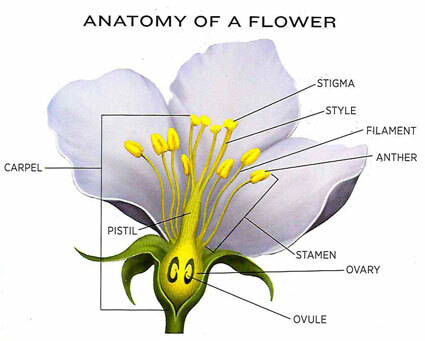 Pollination – the transfer of pollen from a male anther to a female stigma – is basic to the sexual reproduction of flowering plants. Some plants, particularly grasses, are pollinated by wind, and some by water, but the vast majority of plant species – the most recent estimate is 87% – are pollinated by some kind of animal. 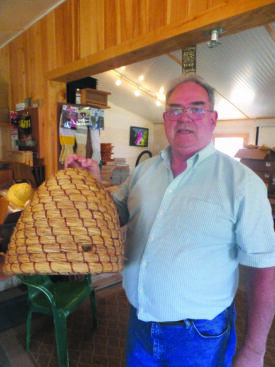 photo by Jack Kittredge John shows one of his Mason bee nesting boxes. The Lamoille River, which starts in the mountains of Stannard, Vermont, and drops 1600 feet while running westward across most of the state until entering Lake Champlain above Burlington, waters much of northern Vermont. Normally a mild and pleasant watercourse, it occasionally becomes a dangerous torrent, most recently in August, 2011 when Hurricane Irene dropped almost 3.5 inches of rain in Burlington during 24 hours. John and Nancy Hayden, owners of The Farm Beyond on the edge of Jeffersonville, Vermont, right across State Route 15 from the river, saw the Lamoille rise until it flooded the highway and coursed onto their land, flooding some of their outbuildings and vegetable crops. Fortunately for them, they designed their farm with some forethought about weather extremes (they met at Syracuse University, taking environmental science courses) and life returned to normal after the waters receded. For many farmers, however, it was a wake up call about neglecting nature.